Here at Seasoned Pioneers we are renowned for sourcing premium and authentic worldwide seasonings. Seasonings are flavourings such as herbs and spices that improve the overall flavour of food. Some of these herbs and spices such as Angelica Root and green or black Cardamom are distilled with clear alcohol in order to make the spirit we know and love: Gin. When used for this purpose, these flavourings are known as Botanicals. We strive to provide Gin distilleries with the finest quality bulk botanical ingredients due to the recent rise of Gin production over the last 5 years. The most important botanical used to make Gin is the renowned Juniper Berries and without them, Gin wouldn’t even exist. Of all the weird and wonderful botanicals used to make Gin, it’s Juniper berries we should be most thankful for. Other notorious botanical ingredients that we stock at Seasoned Pioneers are Coriander Seeds, Star Anise, Grains of Paradise and Cinnamon. Brands can select any combination and quantity of botanicals in order to create a unique tasting Gin. Juniper Berries – whole juniper berries have a sweet, warm flavour with hints of pine. Green berries are unripe, and black berries are ripe. They are found worldwide and hand-picked within the wilderness. Once collected they can be sorted into colour groups in order to gain the desired flavour. Coriander Seeds – typically a rotational crop, whole coriander seeds have a warm and sweetened taste with hints of orange peel and pepper. Their flavour is therefore reminiscent of citrus and spice. Star Anise – a traditional South-East Asian spice, Star Anise has a strong liquorice flavour infused with warm, sweet notes. Cinnamon – suggestive of citrus and clove, the strong warm flavours of cinnamon play nicely alongside components that contribute to a more spiced Gin. Garnishes are the food items used to decorate your Gin and Tonic such as Lemon, Lime and Ginger. Botanicals can also be used as garnishes in order to draw out a flavour infused in the Gin. The key to choosing the best Garnish is to consider the main botanicals that have been used, and to match the Garnish accordingly. For example, a citrusy Gin bursting with fruity flavours might be paired with coriander seeds, lemon or lime. Cinnamon sticks, peppercorns or orange peel contribute warm, zesty flavours that might compliment more spiced Gins. Finally, flowery-tasting berries, citrus peel and fresh cucumber could be more apt to bring out the key flavours of a floral Gin. Gin is a versatile drink that offers a personal experience to the consumer. Certain botanical blends that work alongside the key ingredient Juniper are infused to brand a unique creation. Garnishes can be selected to distinguish and highlight certain notes within a Gin’s flavour profile. We at Seasoned Pioneers understand the importance of providing world-class bulk botanical ingredients to suppliers in order to meet consumer demand. Seasoned Pioneers are based on the Wirral, a peninsula bordered by the River Dee on one side and the River Mersey on the other. Wirral is a mixture of coast, countryside, rural villages, industry and towns. The area is renowned for good dining and shopping, with an abundance of fine restaurants, cafes, farm shops, garden centres, delicatessens and markets. Some retailers place a particular emphasis on sourcing locally produced food and drink. 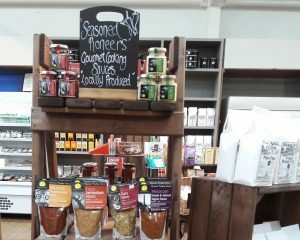 Several fine food retailers in the area have chosen to buy wholesale herbs and spices from us and utilise our free of charge merchandising options to display Seasoned Pioneers logo and products. Our phenomenal range of approximately 300 herbs, spices, spice blends and specialist ingredients are supplied in our signature resealable foil pouches. When displayed on a spice rack, they create an eye-catching and colourful display which customers love to browse. 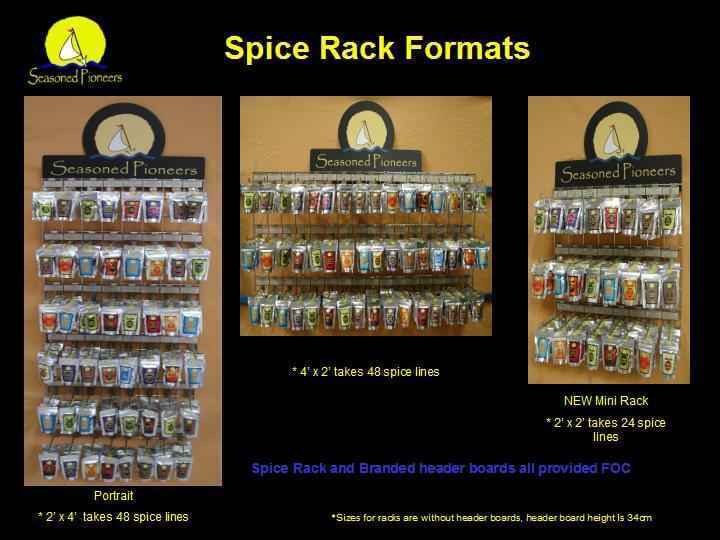 The spice rack and header board with shelf-talkers describing the products are offered at no cost to any business wishing to order trade spices from us. For retailers with limited space or for seasonal products, we can supply trade herbs, spices or spice blends on clipstrips which can easily be hung on display units, pillars, by the check-out or in any other redundant space. Examples of this are clipstrips of trade spice blends for barbecuing, such as Caribbean Jerk Rub displayed next to a meat counter, Mulled Wine Spices alongside the wine selection, Mixed Pudding Spices with baking ingredients and so on. 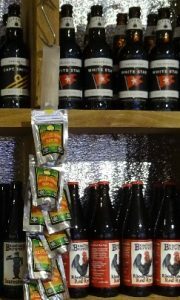 Our Gourmet Cooking Sauces are ambient and therefore can be displayed anywhere within a food retail premises. 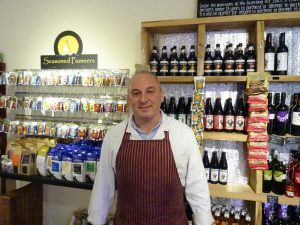 However one local farm shop, Claremont Farm, have found that they achieve good sales by displaying them in their refrigerated cabinets alongside the meat and poultry that complement our cooking sauces. This is a great way of suggesting meal ideas to customers and inspiring them in how to use your goods. Seasonal products such as Christmas food and drink offer great opportunities to maximise sales by creating enticing displays of produce. We hope that these case studies of some of our local fine food retailers will instil a desire to incorporate our products into your own range of herbs, spices, seasonings and specialist ingredients, joining those of us who already work towards ‘Helping Adventurous Souls Achieve Culinary Inspiration’! For any further information, please get in touch, we will be delighted to hear from you and help you set up as a trade spice supplier. 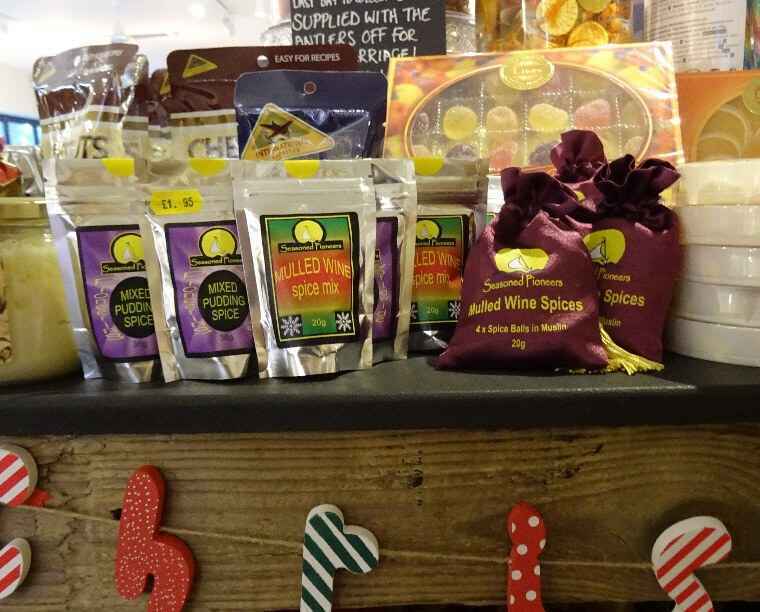 If you are a retailer who has made the discerning decision to stock our wholesale herbs and spices and wholesale seasonings then we have several merchandising options to help you display them and thus maximise your sales. The most popular option of our customers is to display wholesale herbs and wholesale spices on our free spice rack. This is supplied with an eye-catching header board depicting Seasoned Pioneers logo. The spice rack is wall-mounted (fixings are not included) and can hold up to 48 lines. The spice rack measures 2′ x 4′ and can be mounted horizontally or vertically. If you are short of space, we can provide a ‘mini-rack’ measuring 2′ x 2′ and which holds 24 lines. In addition we can supply informative shelf-talkers that fit onto the spice rack describing each product for your customers benefit. These are particularly beneficial if you decide to stock our wholesale seasonings and blends. Many of these seasonings are unusual and the shelf-talkers define both flavour and aroma together with their culinary uses. We have shelf-talkers for all of our wholesale herbs and spices which can be supplied with or without our Recommended Selling Prices included in the text. To differentiate between international cuisines our pouches are colour coded in distinctive and vibrant colours depicting each region of the world. Consequently a fully stocked spice rack is a bright and interesting addition to your business and undoubtedly will attract great attention from your customers. 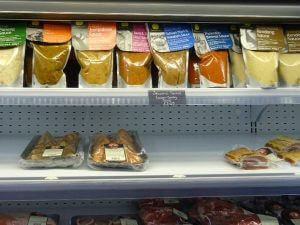 Shelf ready Display trays can be supplied free of charge with your order. Each tray holds six spice pouches, which can be placed wherever you have space and help you to notice when it is time to restock. Ready to hang Clipstrips are the third option supplied free with your order. Each clipstrip holds 12 pouches and they are sent to you complete with the wholesale spices or wholesale herbs attached by hanger tabs. The clipstrips can be mixed products or a single line. These are very space efficient and can be hung in unused areas such as on pillars. Finally, some stockists choose to simply display our products loose on shelves or in baskets, they guarantee to add interest and colour to your business whichever display method you choose! 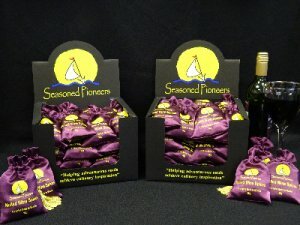 We have recently introduced a display cased for the Mulled Wine drawstring bags containing 40 units. All packaged and shelf ready. 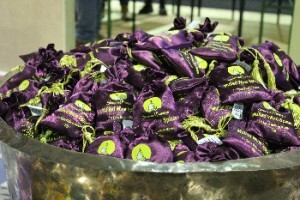 The hand produced drawstring bags contains all the spices required to make lots of Mulled Wine. Ideal for a Halloween party, Bonfire Night, Christmas and New Year celebrations. These can also be given as a Secret Santa gift or dinner party present. Unlike many suppliers, we do not require you to order your wholesale spices, wholesale herbs or wholesale seasonings in case sizes. Instead we offer you complete flexibility on how many pouches of any particular product you wish to order. All that we ask is that you place your orders for wholesale herbs and spices or seasonings with a minimum order value of just £100. In return, you will receive free delivery within the UK mainland. Offshore deliveries may incur a small charge towards the cost of shipping. Our ordering process is simple, you can send your order written in an email to info@seasonedpioneers.co.uk or send it as an attachment to an email. Alternatively you can telephone our friendly office team and place your order over the phone. Restaurants, caterers and food manufacturers have steadily discovered that they can buy bulk spices, herbs, seasonings and spice blends from Seasoned Pioneers. Discerning businesses recognise the benefit of using the very finest ingredients as they ensure the very finest results! We never buy poor quality herbs, spices or seasonings and we never add bulking agents to any of our products. Everything we supply is the absolute best that we can source – pure unadulterated natural product. As a result our products offer an incredible intensity of flavour, colour and aroma. This in turn means that your recipes require less of the ingredient, thus saving you money. All of our products can be supplied in catering packs suitable for manufacturers, hotels, restaurants, cafes, caterers, bakers, butchers, coffee shops, chocolatiers, cookery schools, recipe box suppliers and any other business that needs to purchase bulk herbs and spices or bulk seasoning. Food manufacturing companies have unique requirements when buying bulk herbs and spices. It is for this reason that we offer complete flexibility on the quantities that we can supply. 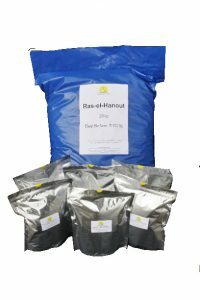 Bespoke bulk seasoning blends and rubs can be made and blended to individual manufacturers specifications, for use in breads, soups, ready-meals, sauces, recipe boxes and much more. It’s not only our conventional range of herbs, spices, seasonings and spice blends that can be supplied in catering or bulk packs, the same applies to our organic and Fairtrade products. If you choose to buy your bulk seasoning or bulk herbs and spices from us, we will pack them precisely to your requirements. From 500 gram to 25 kilogram packs and every size above or between, you just tell us exactly how much you need. Our minimum order requirement for free delivery is just £150, but if your order for bulk herbs or bulk spices is less than that, our delivery charge is very reasonable. 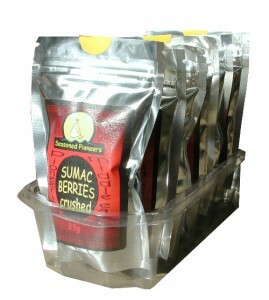 Catering sized orders up to 1 kilogram will be supplied in our signature larger sized resealable pouches. These exclude both light and air, known to be highly detrimental to the products and as a consequence their freshness, flavour, aroma and colour is maximised. Bulk sized orders are supplied in clearly labelled blue poly-liners that also protect the contents and are ready to be stored in your chosen containers. Prices for herbs, spices and seasonings continually fluctuate. They are affected by climatic and agricultural conditions that influence the success of annual crops and harvests. There are times when yields are less than expected but demand is not and this drives up prices as demand outweighs supply. Consequently prices for bulk and catering sized packs are available on application. Simply send us your requirements and we will promptly respond to you with our current prices. The superb quality of Seasoned Pioneers products has been endorsed repeatedly over the years by many renowned chefs and food writers. As a company we are not concerned about becoming the biggest spice trader, our ambition is simply to be the best. We hope that by buying bulk spices, bulk herbs or bulk seasoning from us, other businesses in the food industry will achieve the same great results!